DigiTech is now shipping the new HardWire Guitar Pedals. These pedals feature true bypass and constant high-voltage operation (15-volts) from a single 9-volt battery or power supply. True bypass allows a guitar's true tone to pass unaltered when in bypass mode. Constant high-voltage operation prevents undesired distortion when used with high-output pickups and allows effects pedals to work flawlessly in amplifier effects loops. 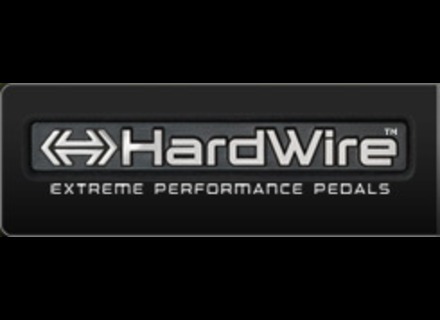 The HardWire Guitar Pedals are crafted from premium, all-metal components to perform night after night, tour after tour. The HardWire lineup consists of the seven distinct pedals: the HT-2 Chromatic Tuner (a guitar tuner with tuning references including flat and double flat), the CM-2 Tube Overdrive featuring a Classic mode and a Modern, higher-gain overdrive mode, the SC-2 Valve Distortion with Crunch mode and a Saturated mode for modern hard rock tones, the TL-2 Metal Distortions with a percussive Tight mode and a Loose mode for detuned guitars, CR-7 Stereo Chorus featuring seven chorus types from classic Analog to modern Multi-Voice settings, the DL-8 Delay Looper with ten delay types from Tape to Digital and a 20-second Looper, and the RV-7 Stereo.